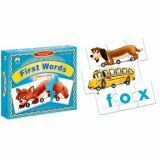 Connect the pieces to complete the large picture and word or flip the pieces and build words without the pictures. Fourteen 3-pieces puzzles. Activity guide included. Boost picture-word recognition skills! Includes twelve 4-piece puzzles with word families for use in two different games and activity guide.